The Reggae Review: Ride, Bob's natties, Ride! 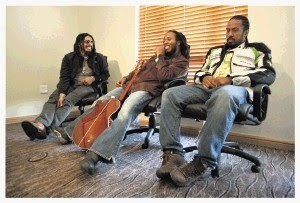 They heard horror stories about South Africa but brothers Ziggy, Rohan and Robert Marley - sons of reggae legend Bob Marley - are in the country to see it for themselves. The trio's trek, on Ducati motorbikes, is being filmed for a documentary. They haven't planned their trip and say they will travel to wherever the roads take them. The brothers, who live in Los Angeles, have already stopped in the Free State town of Parys where they said they it was "cool to meet regular village folk away from the city". The filming of their Marley Africa Roadtrip has already begun. The inspiration for their motorbike epic was their father's journey across the continent 30 years ago to perform at a freedom celebration concert in Zimbabwe. His sons say they are now reviving "a dream our ancestors and family had in mind". "We're having fun, but with a purpose." Ziggy said. The brothers were at Johannesburg's Soccer City stadium on Sunday for the match between Brazil and Ivory Coast. They also watched Nigeria lose 2-1 to Greece in Bloemfontein on Thursday. Ziggy said: "It's been wonderful to get back after a long day and relax by watching football. We love it." Ziggy, a reggae star in his own right, said it was the brothers' first trip to South Africa: "We had no perceptions, but people told us Johannesburg was dangerous." The brothers have sampled some local cuisine - including samp, which Rohan said was "very nice". The trio's bodyguard told The Times that one of the brothers discovered that he had packed only one pair of jeans and would need to get more clothes. Yesterday, the guard said he was planning to book accommodation for tonight because they still didn't know where they were going to stay. Marley Africa Roadtrip is being directed by David Alexanian, who filmed Ewan McGregor's motorcycle trips the Long Way Round and Long Way Down for the BBC. Alexanian said filming began in Los Angeles: "We've been travelling a lot since we arrived in South Africa a week ago. "Our goal is to spend the next few weeks with people. Not just city but village folk, and bumping into unfamiliar territory."